Awareness about recycling motor oil is limited as compared to other recycled products such as paper, glass and metals which are relatively popular. It is imperative that we understand the damage we cause to the environment by throwing oil in garbage and storm drains. It doesn’t take more than one gallon of oil to pollute a million gallons of water. Toxic metals such as arsenic, zinc, benzene and cadmium are generally found in used motor oil and can cause environmental damage if poured on the ground. At an individual level, oil in vehicles, be it trucks, cars, boats or some other recreational vehicle, can be carefully collected for safe disposal. Just follow the instructions given in your owner’s manual and drain the oil by opening the drain plug in your vehicle. Ensure that the container to collect the oil is sufficiently large to avoid any wastage through spilling. The next step involves changing the oil filter taking care that the residual oil in the filter does not spill. Once the oil is completely drained, replace the oil filter and reinstate the drain plug. Fill in the new oil through the oil fill cap as per directions. Locate service stations and quick lubes in your area that accept used oil and filters. An interesting website www.Earth911.org also provides information on collection centers by zip-code. This collected used motor oil is then re-refined, reprocessed or blended with other fuels. 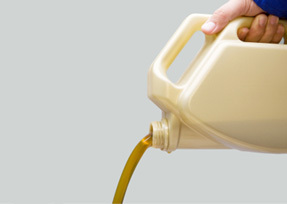 Used motor oil has a number of uses; the biggest among them is being refined into a base stock for lubricating oil. It is also used as fuel in large and small industries in furnaces and boilers. It can be used in manufacturing asphalt and steel, cement kilns, in turbines and power plants. It is also used in custom-made industrial space heaters which account for about 11% usage of used motor oil today.